I was disappointed when I saw that B Street Eats was closing in Murray Hill last year and lamented that I didn’t go more often than I had. However, my interest was piqued by the promise of a new concept by the Maple Street Biscuit owners. 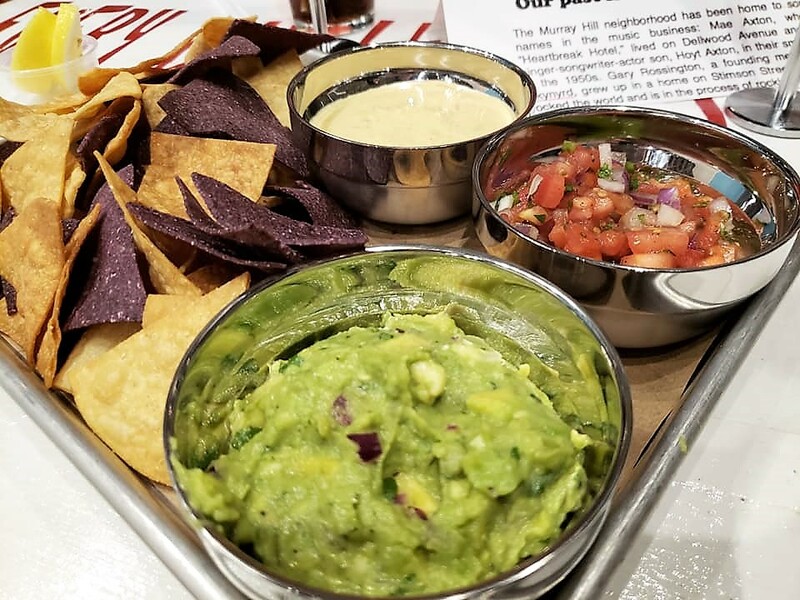 All was hush hush for awhile as they designed the concept and menu, but when I finally saw the post revealing the new Murray’s Taco Bodega I was surprised. 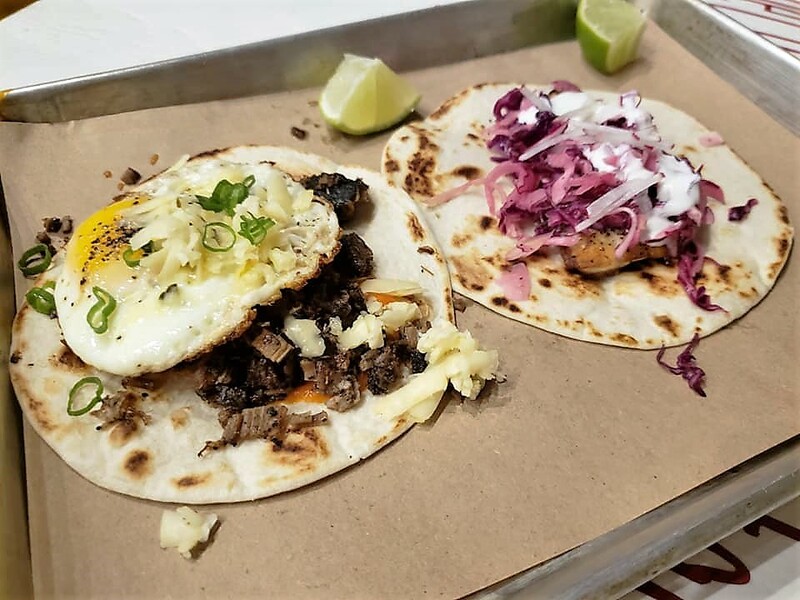 With Corner Taco, Nacho Taco, and El Jefe flanking the space in the surrounding miles, I wondered how Murray’s would differentiate themselves from the sea of tacos available to the neighborhood. As the restaurant got closer to their opening, I began to see social media posts from long time contractor for Maple Street Biscuit Mark Ballinger, who had personally been dabbling in smoking meats for years. Following that, involvement from former Kitchen on San Marco Chef Ryan Randolph became apparent. That’s when I started to get excited — the experience of these two in the kitchen coupled with the management power of Maple Street could only be a match made in heaven. We headed out to the soft opening of Murray’s Taco Bodega ready to do what we do best — eat our weight in tacos. The set up for ordering is fast casual counter service, just like the former B Street Eats as well as the Maple Street locations. Once you order you receive a card with a famous Murray on it (enjoy checking out the other patrons’ Murrays around you too!). The interior space is perfect. 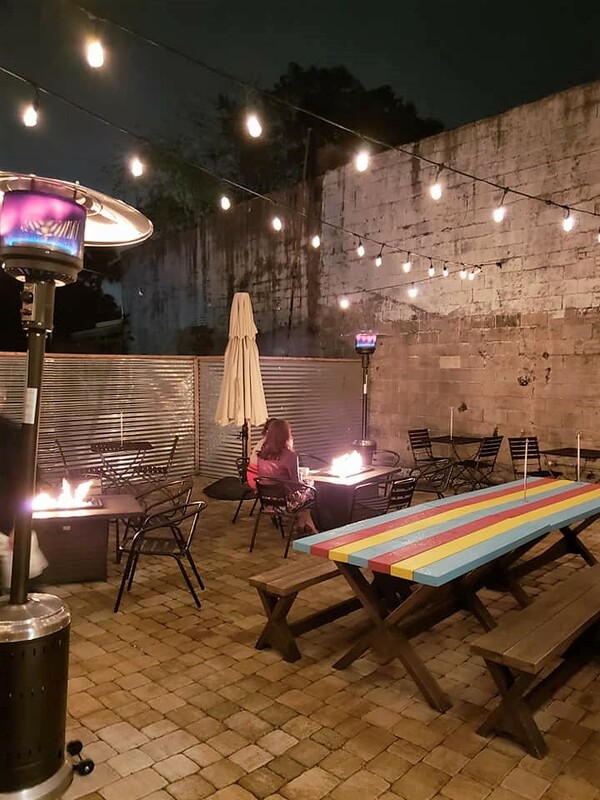 The minimalist decor is comfortable and bright, the tables are hand painted with funny taco sayings and taco motivational quotes perfect for the ‘gram, and the large outdoor space is a relaxing respite to relax in with a drink and a snack. The menu is streamlined, easy to understand, yet full of a surprising variety of choices. Category one contains your tacos. They’re available on flour, corn, hard shell, or lettuce wraps. They range from $3-$4 per taco for the signature tacos. We ordered 2 of the Murray’s Signature tacos with house made corned beef, dijon crema, and slaw ($3.95), a Brussel Sprout taco with black beans, chipotle crema, and roasted garlic ($3.45), a Brisket taco with and over easy egg, pepperjack, and ranchero ($3.95), and a grilled Market Fish taco with slaw, radish, and lime crema. For sides, they have Mexican Street Corn (on the cob), charro beans, black beans, roasted cauliflower, adobo broccolini, chips and salsa / guac / queso, or a trio flight which we opted for for $9.95. I also threw on a dessert of churros and chocolate for $4.95 because so help me I will never pass up a churro. There are rice bowls, tostadas, or build your own tacos to choose from as well. The options are pretty limitless. We’ve been to a lot of media dinners over the years, and I’ve rarely seen one go this smoothly for a soft opening. The food came out fresh, hot, and everything was correct. The servers were quick to bring refill drinks. The only thing we had to request throughout our visit were napkins. That’s impressive by any soft opening standard, but is definitely reflective of the years (maybe decades) of experience behind the scenes. Our food came out staggered but quickly for us to dig in. My first bite (and favorite bite) was the brussel sprout taco. The brussels are roasted to perfection with a crisp smoky flavor that is complemented by the lightly spiced chipotle crema and the dense black beans. I actually went back a second time this week and got another brussel sprout taco, that’s how much I loved it. The first one was a little too overstuffed and I had to rebuild my taco as I ate it, but the second one didn’t have that problem. You know what they say, always keep another tortilla or chips under a taco and BOOM, another taco! The Murray signature taco was the second favorite of the night and for an unlikely reason. Who would have thought a few pickled mustard seeds would add so much flavor? The salt and vinegar with the corned beef was pretty divine, and was well balanced with the crispy pickled red onions that I could eat by the forkful. This is truly a signature taco to talk about. Mark Ballinger’s brisket was up next, and I was stoked to finally try some of his smoked meats I’ve seen on instagram for years. It didn’t disappoint. Tender, fall apart, and smokey, the brisket melted with the yolky egg on top. The grilled fish taco was the most simple and honestly the least memorable of the evening. Not because it wasn’t delicious, but didn’t have the distinct flavors of the other tacos. If you’re craving a fish taco it’s a great option, but you can skip it for more exciting tacos otherwise. Our dip flight was well worth the price. The guac was freshly made and chunky, which I always prefer. The queso was the winner of that plate. Former customers of B Street Eats will remember their delicious thick queso. It was a fan favorite then, and will be now. The dip trio is finished off with a cold tomato salsa that will please any traditionalist. 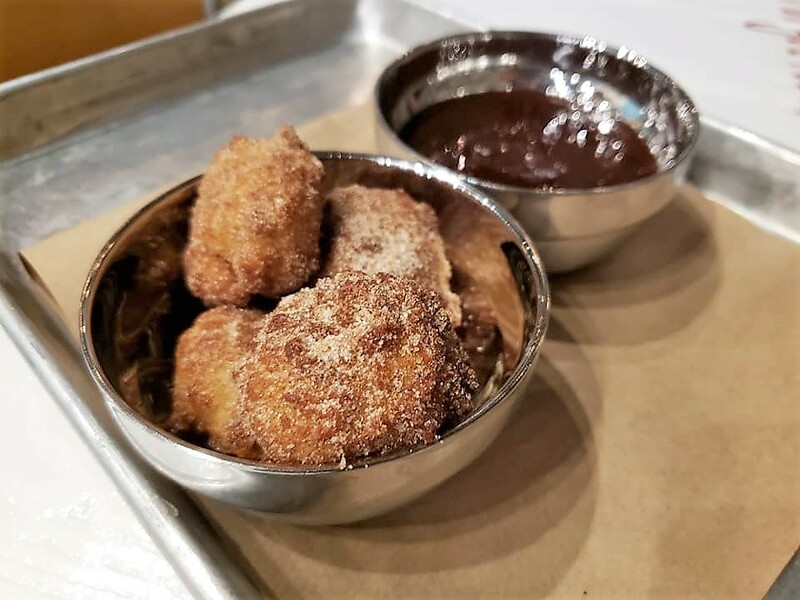 The churros were a pleasant surprise, coming as churro bites with a spicy Mexican chocolate dipping sauce. I won’t skip those on any trip! On my return visit, I tried their other dessert out of sheer curiosity. The Pineapple Taco contains grilled pineapple in a sopapilla shell topped with whipped cream. It will be a tough choice to choose one dessert or the other, but for the price I think the shareable churro bites are a better value. 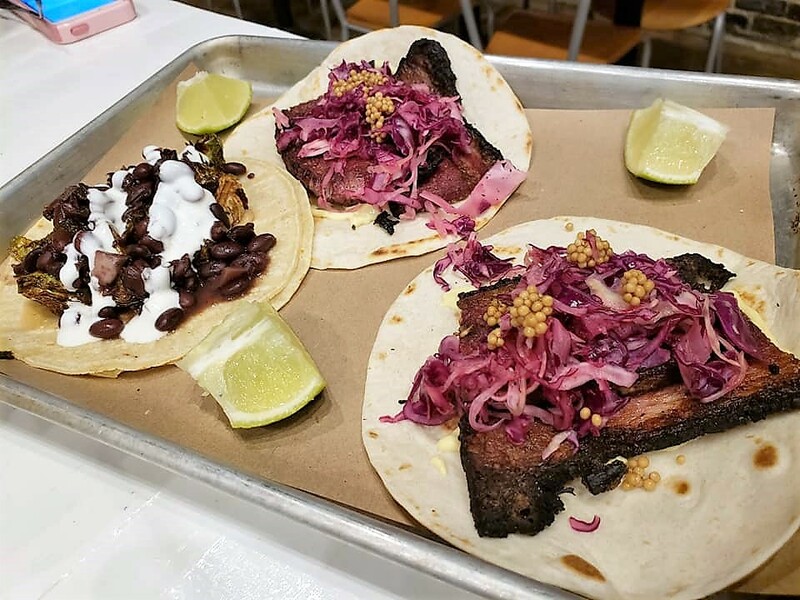 Murray’s Taco Bodega has found it’s place and stands out from the plethora of taco options and will prove a great addition to Murray Hill with their creativity and unique flavor combinations. They aren’t trying to reinvent the wheel with Murray’s, they’re just putting out great food in an relaxing atmosphere. With a neighborhood in the process of redevelopment, this will be a sure anchor. I also found out that next door neighbor Fishweir Brewing will have ordering with Murray’s, so if you aren’t into the beer and wine selection at Murray’s, you can still enjoy tacos and a local beer next door! What is better than that?! Tagged Beer (Breweries and Restaurants), Beer and Wine, carnivore, Casual, Dinner, good for families, kid friendly, lunch, outdoor seating, tacos, vegan friendly, Vegetarian Friendly. Bookmark the permalink. What a delightful review. It made me want to go there right now!! I’m so anxious for my first bite from Murray’s. Thanks for the great review.